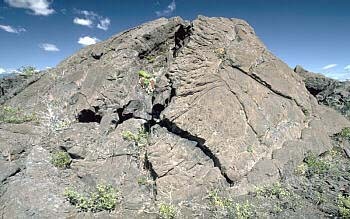 Tumulus -- Tumuli are common features on pahoehoe surfaces. They are oval to domed shaped hillocks from 1 to 10 m high, often associated with an axial fracture along the length of the structure. Tumuli result the buckling of brittle crust by the upward flow of underlying lava. The example here is a tumulus on Hilina Pali road on the south flank of Kilauea Volcano, Hawaii. Courtesy of J.D. Griggs, USGS.